The map above is represented by the cities and counties of Augusta County and Waynesboro. 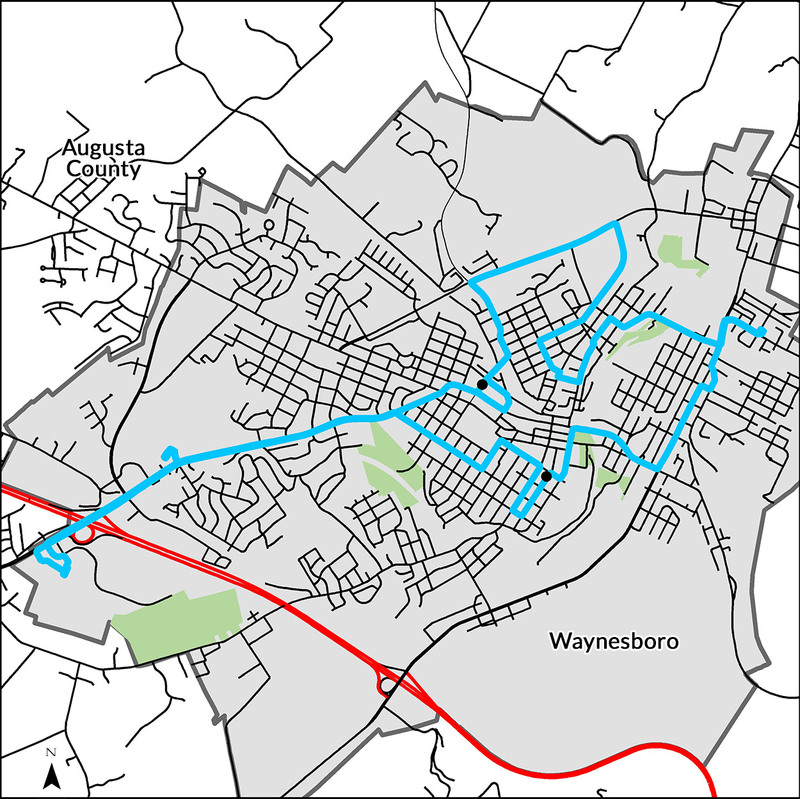 Waynesboro Circulator, Monday – Friday: 6:30 a.m. – 6:22 p.m. The Waynesboro Circulator and the Stuarts Draft Link connect to the 250 Connector and each other at the Walmart (Waynesboro), when they run at the same time. The Waynesboro Circulator does not stop at Waynesboro Town Center when the 250 Connector serves the stop. BRITE Brings Dependable Bus Service To Waynesboro. Our Waynesboro Circulator provides consistent bus transportation throughout the city of Waynesboro on Mondays through Fridays, 6:30 a.m. to 6:22 p.m. Enjoy comfortable travel to work, appointments, shopping, community services and even the gym on our clean buses. Stops include, but are not limited to: Walmart, Waynesboro Town Center, the DMV, the Rosenwald Community Center, Social Services, Kroger Downtown, Springdale, and the Library/YMCA. Affordable Fares Fit Your Budget. Our drivers do not make change, so please be prepared with exact fare. Check out our trip planner to schedule your next ride or view all our regularly scheduled routes! Personable Service Makes All The Difference. You’ll get to know members of your community when you ride BRITE. Our friendly support team patiently answers all questions and our safety and riding tips makes it all easy. Scheduling ADA Compliant Paratransit transportation is a simple process and communication assistance helps elevate the experience of all passengers. Live your life with BRITE and travel the greater Staunton, Waynesboro, and Augusta County with ease. The Central Shenandoah Planning District Commission manages the BRITE transit system, and is committed to ensuring that no person is excluded from participation in, or denied the benefits of, or be subject to discrimination in the receipt of, its services or programs on the basis of race, color or national origin or any other characteristics protected by law, including Title VI of the Civil Rights Act of 1964, as amended. Further, under the Americans with Disabilities Act (ADA) of 1990, no entity shall discriminate against an individual with physical or mental disability in connection with the provision of transportation service.